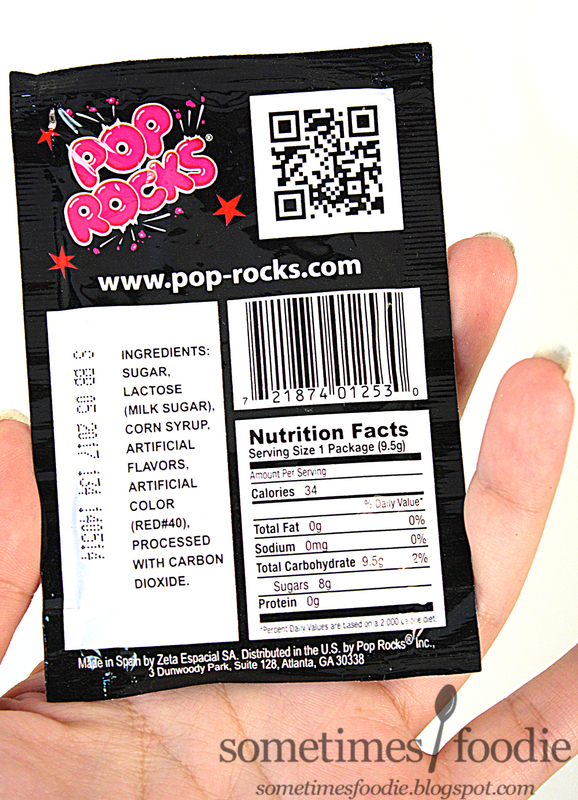 The flavoring may remind me of 90's tunes, but the overall look of this package is very 80's. We've got bright colors, simple illustrations, and fizzy soda bubbles. It's not perfect, but it has this fun Lichtenstein-esque Pop art feel that I really enjoy. I did a little bit of research, and it turns out that back in 2006 when Cybele reviewed these on Candyblog, the packaging was totally different! Of the two, I prefer this packaging, but they both have their flaws. 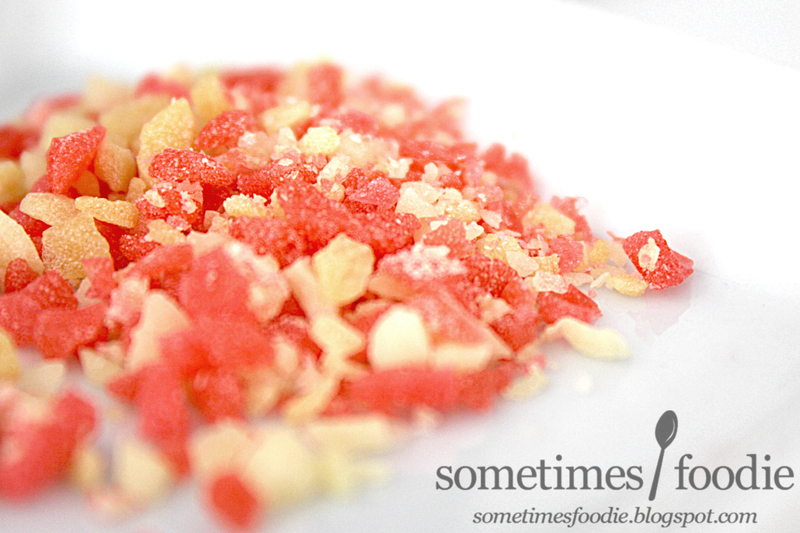 Inside the pouch is a mixture of (mostly pink) and tan-ish off-white candy flakes. 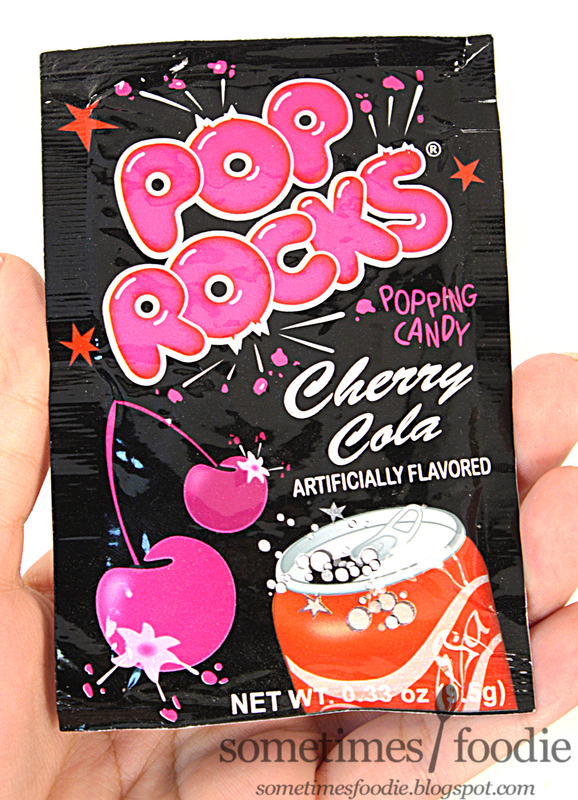 Visually, it looks like this is just a mash-up of two pre-existing Pop Rocks flavors: Cherry and Cola, but if that's the case, it's really unbalanced. There is way more cherry here than cola. Maybe it's a new formula after all? Maybe all of the pieces are the same flavor and just differently colored? I poured some of the candy into my mouth and it instantly started popping away, like normal, but the overall flavoring was very cherry heavy. So I guess my original theory of mixing two flavors was correct. This tastes sweet like artificial cherry candy, and towards the end (depending on how many tan candies you got in your mixture) there's that classic Haribo-like cola finish, but it's very mild. These are way more cherry than cola, which doesn't taste bad, but it has the potential to be so much better! There has never been a flavor of Pop Rocks I haven't liked, but this was a bit disappointing because the cola flavoring was so weak. If there had been a better balance between the two, this would be an amazing product and possibly my favorite Pop Rocks flavor of all time, but due to it's lack of cola-ness, it ends of being "just okay."